A striking reindeer created by a McLaren High School pupil has been voted the most popular design on Stirling’s first Reindeer Trail. Nina Harrison’s reindeer, which had pride of place in Stirling’s Tourist Information Centre during the festive season, won 200 votes from competition entrants asked to choose their favourite reindeer. 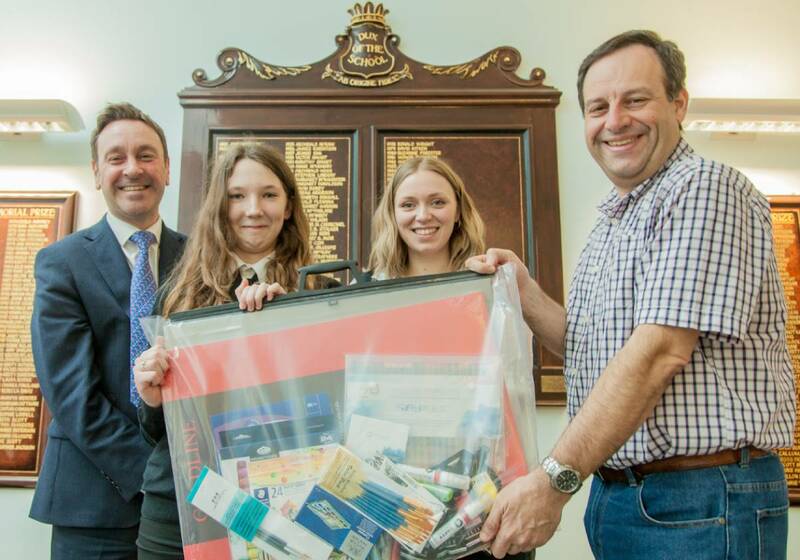 Nina was presented with a pack of art supplies by David Black, vice-chair of Go Forth Stirling, the city’s Business Improvement District, which organised the initiative. “I enjoyed taking part in the project and it’s really cool to be named the winner. Pupils from McLaren High, along with schools across the Stirling area, were invited to come up with festive designs for the Reindeer Trail. A total of 20 creations were chosen from 160 entries and the successful schools were provided with paints to decorate life-size reindeer which were based in shops and cafes around the city. Nina, who lives in Doune, came up with an eye-catching blue reindeer which featured Santa’s sleigh being pulled by a herd of reindeer. It was displayed in the VisitScotland iCentre on St John Street and proved popular with visitors. “It is wonderful that the reindeer which sat in our Stirling iCentre has been voted the best of the herd. Nina’s teachers also praised the project which they ran with their first-year art classes. “We gave the students the brief and they came up with their own ideas and designs. “It was a fantastic project for them and great to have something different and unusual to be involved with. “The reindeer initiative captured young people’s imagination and motivated them to come up with creative ideas. “Working with a two-dimensional design which then led to the creation of a 3D object which they could see come to life was wonderful. The inaugural Reindeer Trail was held during the run up to Christmas 2018 in a bid to increase footfall around Stirling city centre and create a festive atmosphere. Shoppers were encouraged to pick up a map complete with clues and find all the reindeer. They were also invited to vote for their favourite with Nina’s creation proving the most popular. “I was delighted to present Nina with her prize and was so impressed with her design and indeed all the reindeer which pupils produced. Published by Blackburn Communications on March 29, 2019. Photo by Janie Meikle Bland of Picture The Possible. As featured in Stirling Observer, What’s On Stirling and Primary Times.